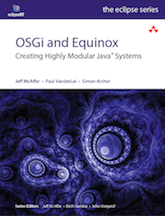 The goal of the Equinox Incubator is to experiment with techniques for broadening the range of Eclipse platform runtime configurations. For example, areas such as security, the use of Equinox on the server and Aspect weaving are prime candidates for investigation in the Incubator. These issues do not severely impact the usefulness of Eclipse as a development tool platform but they do affect the use of Eclipse in more constrained environments (e.g., handheld devices, IT managed environments, mass-appeal applications, servers, etc.). The Incubator project will investigate such issues and develop approaches which are practical and applicable to the main Equinox code base. A cool, lightweight, infrastructure for monitoring running OSGi based systems. Seeking to enable and integrate Java security mechanisms with Eclipse. See the wiki for additional info. This incubator project is targeted at eliminating barriers to using and integrating OSGi (and Equinox more specifically) on the server. Note that some of this work has graduated. See the server-side website. This is the incubator project for the Equinox p2 component. This incubator project is targeted at implementing prototypes of the specifications developed by the OSGi Alliance while the specification is being developed. Console with telnet and ssh access features for Equinox. For an understanding of how work is carried out in the incubators, check out the How to Incubate guide. See the Equinox Incubator Archive for details of previous work areas.